Tuberous begonias make even the most experienced gardeners stop and marvel. Their lush leaves and extravagant colors enliven summer shade-spots as few other flowers can. Keeping begonia tubers viable over winter is critical to gorgeous growth in the summer. Materials may differ, but gardeners agree on the importance of taking extra care with these delicate beauties. Continue regular watering and grooming of tuberous begonias even when the blooming season comes to an end. Between late summer and first frost, begonias put their strength into tuber, rather than floral, growth. Good care means that next year's tubers will be larger and stronger than this year's. Cut back begonias as nights begin to cool, to avoid heavy drooping stems and leaves tearing tubers. 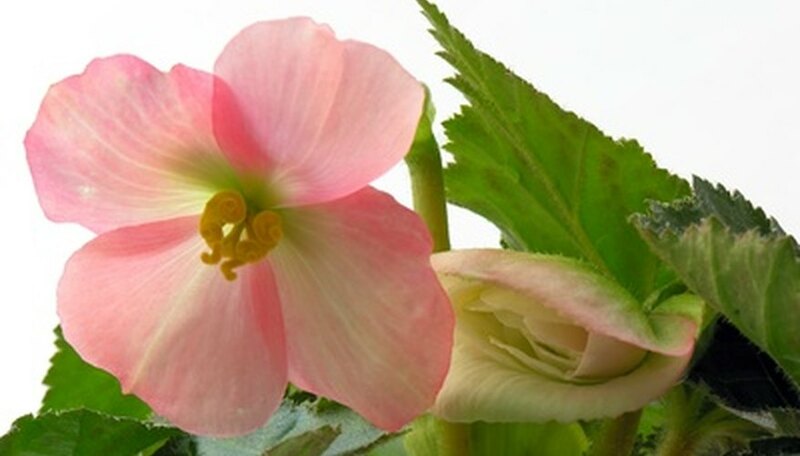 Stem limpness will signal the end of a begonia's growth season, even before leaves fully die. Loosen tubers from soil with a hand spading fork or trowel. If stems are watery or dry and ready to pull off with little effort, remove them. If they resist separating from the tuber, leave a 1- to 2-inch length of stem until it is ready to pull off. Brush soil off tubers with an old paint brush, or rinse them with a hose and dry off with paper towels. Set tubers on a sheet of wire mesh or a paper-lined cookie sheet to dry and cure for several days. Curing lets excess moisture dry and toughens the outer skin, keeping rot and disease at a minimum during winter storage. Put a dry storage medium into brown paper bags. You can use sand, peat moss, or vermiculilte; some commercial packagers use wood chips or shavings. Place the cured tubers in the medium. Store at a constant temperature above freezing, ideally between 50 and 60 degrees F, in a moisture-free area. Check tubers frequently for signs of decay, mold or disease. Remove problem areas or discard any fully affected tubers. C. Delaney, on Let's Go Gardening, suggests leaving tubers in pots in a soil mixture that can be completely dried out; cover pots to prevent rodent damage. Save small cartons or shoe boxes for stronger moisture-protection than provided by a paper bag.